I had the chance to visit this incredible geological wonder in Wyoming in order to take photos for the commission. The pointed plates are Bentonite, up to 3 stories tall. The valley stretches away several miles to the south. 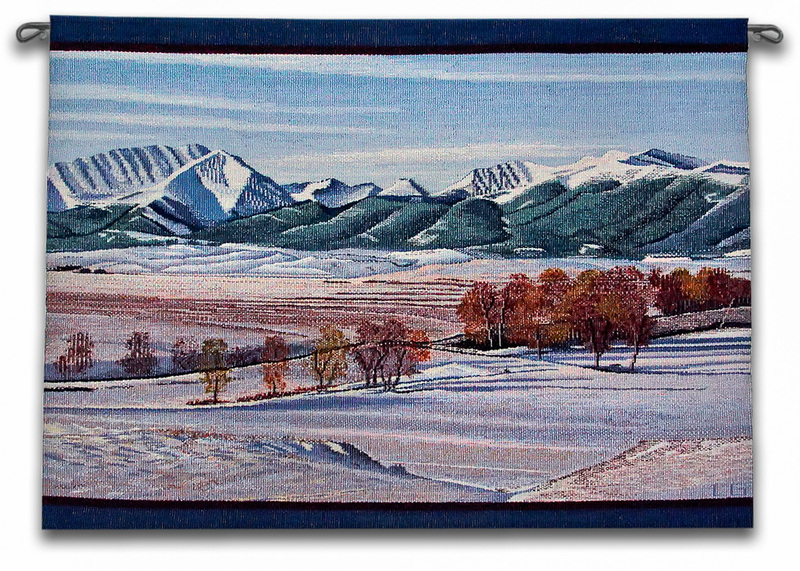 The tapestry hangs in the headquarters of Wyo-Ben in Billings, Montana .The title is Pie Pans, 6'1" X 39"
This was very challenging and ultimately rewarding to weave .The title is Lake Chelan, 38" X 29.5"
Sweet Grass Fall, 38" X 28". This was commissioned as a wedding gift for someone who grew up in this area. Otter Creek Ranch, 38" X 29.5". This was commissioned as an anniversary gift. Upper Ice Lake, 38" X 29" This was commissioned to celebrate a new company, Ice Lakes Fruit. Legend Rock Quartet, 38.5" X 41.5" These designs are petroglyphs of the Dinwoodie era in Wyoming, some of hundreds etched into cliffs. Flat Car Bridge, 38" X 28.5"